Lamina varies from simple to pinnate or bipinnatisect, ovate to narrowly ovate in outline, 40-80 x 15-30 mm, pinnae 8-25 mm long, 1-1.5 mm wide, densely hirsute with long stiff appressed hairs. Petiole 40-85 mm, erect. 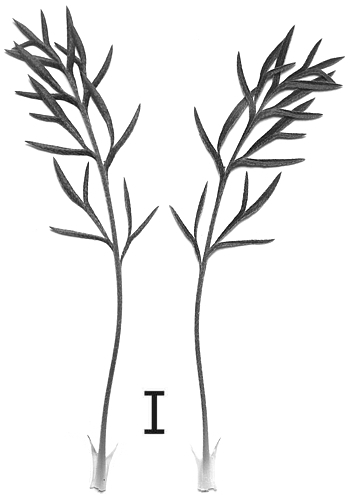 Stipules subulate, adnate to petioles for 1/2 - 2/3 of their length. Scape, bearing 2-3 pseudo-umbellets, each 2-7-flowered. 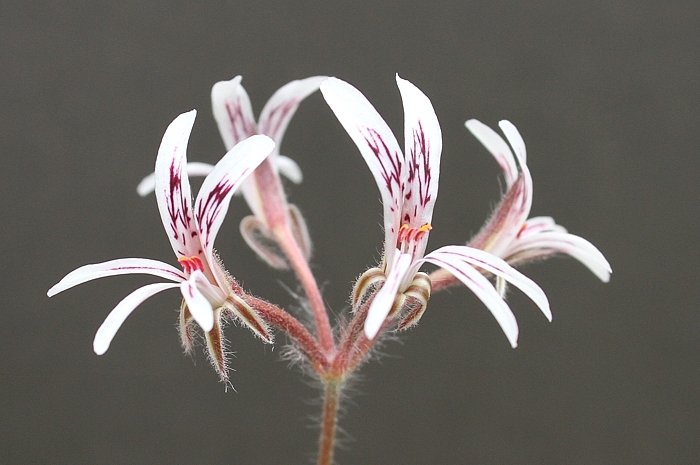 Pedicel cca. 0.5 mm. 5, posterior usually triangular, 5-8 x 1-3.2 mm, posterior erect, others recurved. Hypanthium 6-16 mm, reddish brown to wine-red. 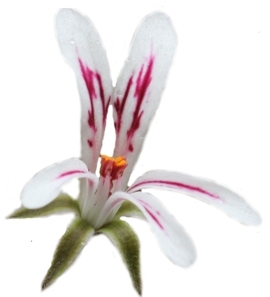 5, pink to pale pink with conspicuous wine-red markings in the centre, sometimes leaving only a narrow pink margin, patent during anthesis. Posterior two ligulate or narrowly spathulate, apices rounded, truncate or emarginate, 7-16 x 2.2-4 mm. Anterior three narrowly spathulate, bases attenuate, apices rounded, 7-15 x 1.5-2 mm. 5 fertile, concealed within the floral sheath, posterior one 1.5-4 mm, lateral two 2-4.5, anterior two 2-5 mm. 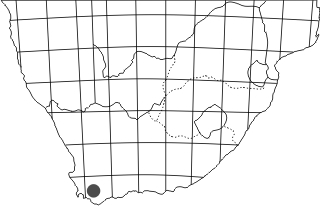 P. caledonicum does not have a very wide wide distribution, possibly because the Overberg region of the Western Cape is so intensively farmed. Here a photograph from Shaw's Pass, the locus classicus for this species. 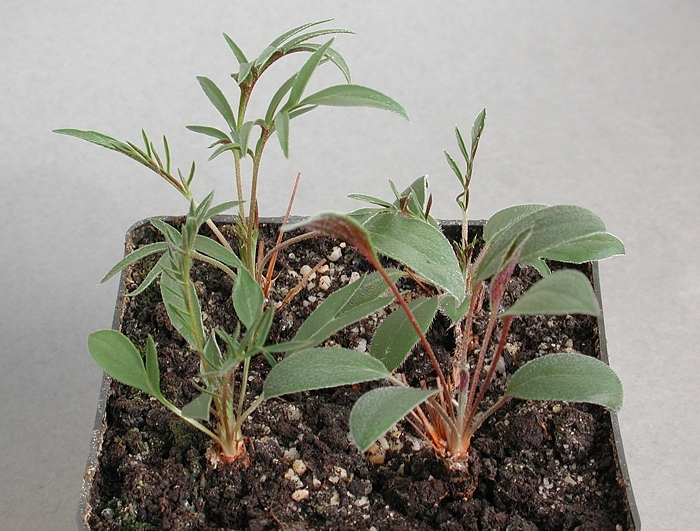 A typical example of heterophylly typical of some hoareas, e.g. P. longifolium, P. longiflorum or P. proliferum: some years, pinnate leaves develop, other years not, which has lead to much taxonomic confusion.